Left Cadell Monday morning heading NW making for Port Augusta and will look for a camp later in the day. Past through numerous small towns but time did not allow us to explore them all. Stopped in Georgetown for a lunch pie. The general and only store had old style polished serving counters that have not been seen in most shops for half a century or more. We then stopped at Laura the hometown of C.J. Dennis (The Sentimental Bloke), a prosperous looking country town with wide streets and lots of shade trees and best of all a country butcher so we stocked up on meat. As it was getting on by then we decided that nights camp would be at Hancock’s Lookout which was only 44 kilometres short of Port Augusta. This turned out to be a good, if somewhat windy campsite. Six kilometres up a steep and windy dirt road which was good because such a road keeps out most caravans and motorhomes. 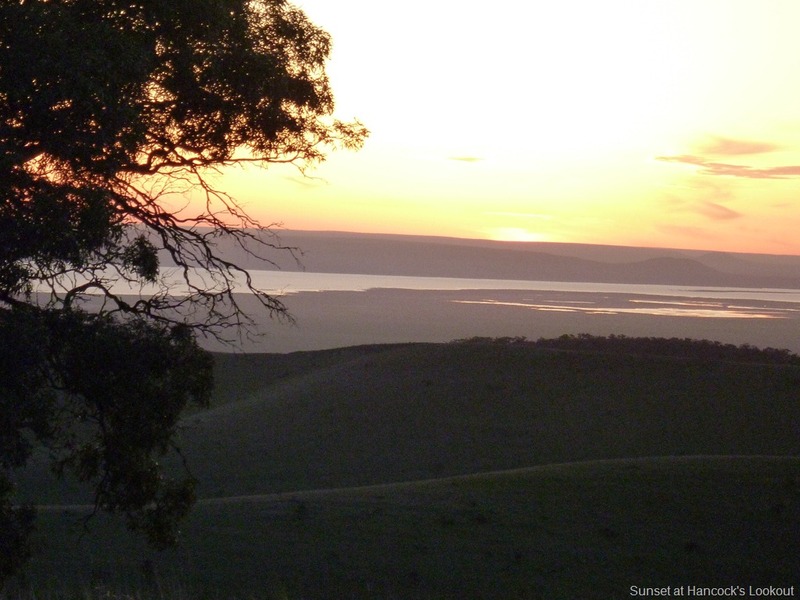 Spectacular views of the northern part of Spencer Gulf, the sunset was magnificent. This part of South Australia is Hans Heyson country and the gum trees around our campsite were certainly evocative of his paintings. However at sunset the breeze got up, which I suppose is only to be expected when on a promontory at 600 metres and didn’t let up all night. In the morning we investigated why Bob’s two way radio had been playing up and found a broken wire in the microphone. Used the Internet to find a contact in Port Augusta and it turned out to be easy to get a replacement microphone there. 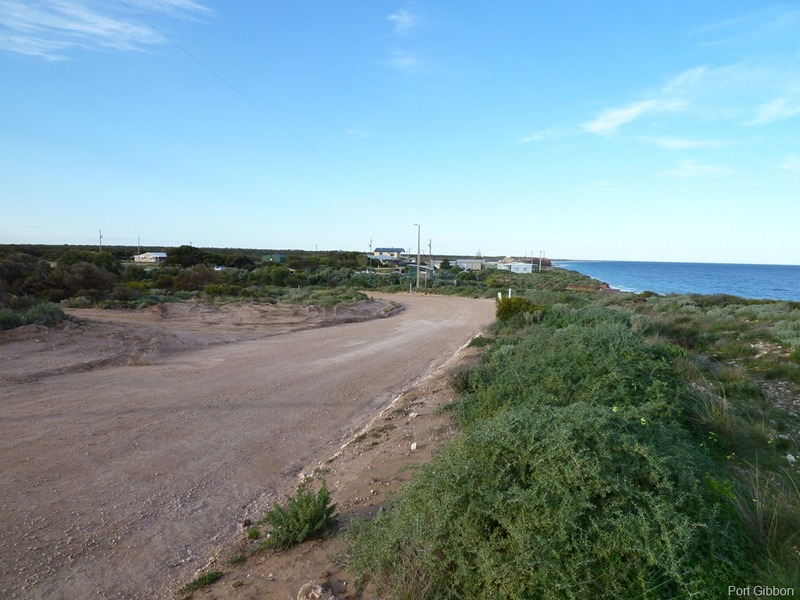 So once again in vehicle to vehicle communication we headed south west down the Eyre Peninsula making for Cowell which had some likely camp sites close by. Stopped at Cowell for a look and lunch and to pick up some bread. Big boat ramp which we learnt is used by the local oyster industry which we were told gets its sprats from Tasmania. Somehow we always seem to gravitate to the waterfront! Headed further south on a narrow dirt road that follows the coast to The Knob Beach Park Area to look at camping there. Whilst we could have camped there it wasn’t all that good so we went another 5 kilometres to Port Gibbons. This turned out to be a great free camp on the foreshore. Port Gibbon itself is composed of only about a dozen buildings with most being weekenders. We decided to stay two nights here to catch up on a bit of washing, do a bit of fishing and just generally relax. The fishing as usual for us did not produce any fish but it was enjoyable as was the long walk on the beach. We also collected some driftwood for our evening camp fire. It is still fairly cold, only 6 degrees in the van this morning and we sit around the fire of a night in coats and beanies but the days are not to bad about 18 degrees today. Still I can’t wait to get to warmer weather! 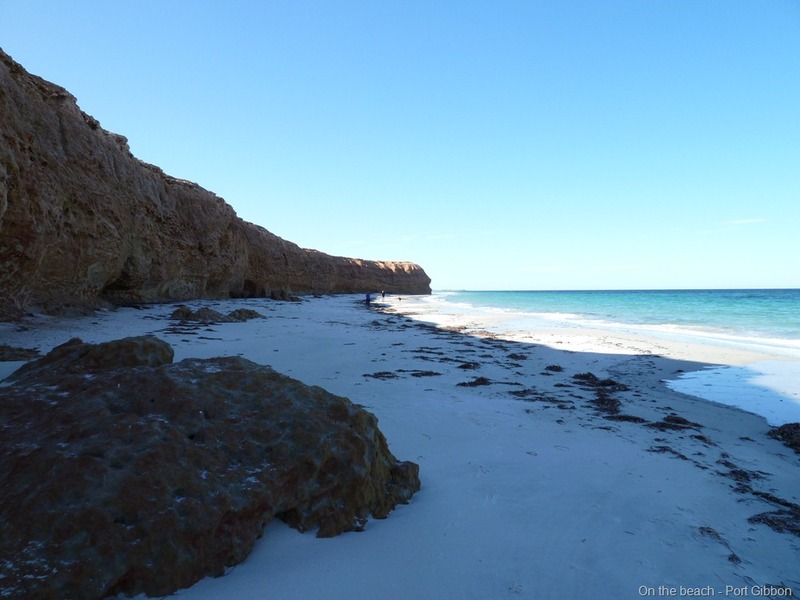 This entry was posted in On the wallaby and tagged Eyre Peninsula, Port Augusta South Australia, Port Gibbon, Sentimental Bloke. Bookmark the permalink. what beautiful photos and lovely places. Continue to enjoy.